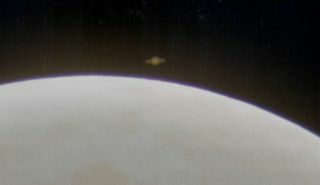 Saturn in occultation behind the moon, on Sept. 18, 1997. The May full moon will rise on Wednesday (May 14), giving stargazers with clear skies in Australia and New Zealand a special treat: a view of Saturn slipping behind the moon. And you don't have to be Down Under to see the event, you can watch it live online. The Virtual Telescope Project in Italy has teamed up with stargazers in Australia to stream live views of Saturn and the moon in a free webcast early Wednesday. Weather permitting, the occultation of Saturn by the moon should be an amazing event, especially in telescopes that reveal Saturn's brightest moons. You can watch the Saturn and moon webcast on Space.com beginning at 6:15 a.m. EDT (1015 GMT) on Wednesday. You can also follow it directly from the Virtual Telescope Project website. As with any skywatching event, the webcast will be dependent on weather at the observing site. Wednesday, May 14, early morning. The Full Moon will pass just below the planet Saturn. Observers in southern Australia and New Zealand will see the moon occult Saturn. Saturn is just appearing from behind the moon as seen from Melbourne, Australia. "I'm pleased to confirm this amazing occultation live feed, via the Virtual Telescope Project, thanks to a few observers in Australia," astrophysicist Gianluca Masi, host of the Virtual Telescope Project webcast, told Space.com in an email. Editor's Note: If you live in Australia or New Zealand and take an amazing photo of Saturn and the moon that you'd like to share for a possible story or image gallery, please contact managing editor Tariq Malik at spacephotos@space.com. Wednesday's occultation of Saturn by the moon will occur when the moon is at its brightest, during its full phase. The full moon of May has many names. They include the Milk Moon, Flower Moon, or Corn Planting Moon. "The Full Moon will pass just below the planet Saturn," skywatching columnist Geoff Gaherty, of Starry Night Software, wrote in Space.com's monthly night sky guide. "Observers in southern Australia and New Zealand will see the moon occult Saturn. Saturn is just appearing from behind the moon as seen from Melbourne, Australia."